News in from Moran Yacht & Ship of a currency switch from euros to dollars and a consequent price drop on their listing for sale, the 39.7 metre motor yacht Apostrophe. 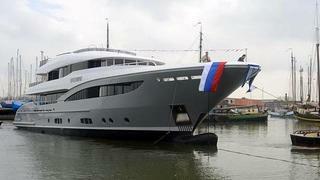 Apostrophe was built by Dutch superyacht yard Hakvoort to Lloyds class and was delivered in 2013. Exterior styling and interiors are by Reymond Langton design, and she was a joint winner at the 2014 ShowBoats Design Awards in the category of Exterior Design Award – Displacement Motor Yachts of 30m to 59.99m. MCA compliant, her Art Deco interior features ebonised walnut and macassar joinery, with elegant mother of pearl inlays and a special feature is an entrance with an open stairwell surmounted by a custom-designed chandelier from Crystal Caviar. 10 guests are accommodated in five generous staterooms. The master suite is full beam on the main deck offering panoramic views, and there are a further two double and two twin cabins below, all with en suite bathroom facilities. Twin Caterpillar C-18 engines give her a range of 3,800 nautical miles at her cruising speed of 11 knots. Apostrophe is now down from €24.9 million to $30.9 million.